Disclaimer: NY Spender is not a political blog. The following post is not about politics but about fashion. 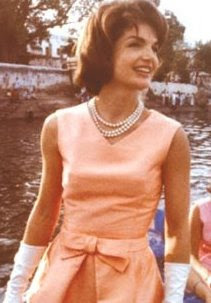 I am fed up with all the criticism to Sarah Palin regarding the $150,000 she spent on her wardrobe. You want to know my first thought when I heard that news: "That's all??" One hundred and fifty thousand dollars is a lot of money, I agree, but the fact that she is the Vice Presidential candidate puts that money in perspective. Unless you are a democrat, of course. I mean there are plenty of women that spend that kind of money on clothes, there are even fictional ones that get idolized for doing so (Carrie Bradshaw). Since when running for such a high political position as VP, where you should dress as sharply and as polished as possible, calls for Target clothes? Did Jackie shop at Wal-Mart? Or did she know that designer clothes were so much better than the cheap stuff from Target (yes, I know, there was no Target then, but just play along...)? And don't give me the "she was rich" excuse, because you can be rich and still be frugal and buy inexpensive clothes. Nobody puts a gun to your head. Designer is, most of the time, the better quality choice. And people know this. Period. 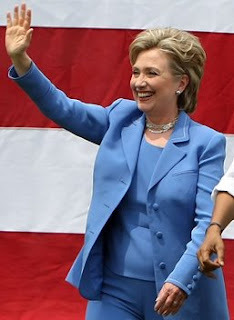 The Los Angeles Times reported earlier this year that Hillary Clinton’s custom made pantsuits from Forest were worth about $6,350 a piece retail. Now think about how many different pantsuits have you seen Hillary wear. But it's ok, and nobody complained. Because she is a democrat. If someone ever made me the personal stylist to one of the USA Vice Presidential Candidate, I wouldn't walk... I would RUN to Saks Fifth Avenue or Neiman! I wouldn't go to Target! Nor would I go to J.Crew. 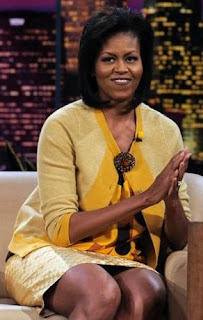 But Michelle Obama wears J.Crew! Sure she does! Especially a few days after all the $150,000 criticism to Palin. Michelle isn't stupid you know? It's the people sitting at home and watching Jay Leno, that are stupid. Stupid for falling for it. 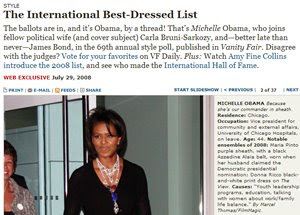 In July 2008, Michelle Obama topped Vanity Fair's International Best-Dressed List. You don't top the list with clothes from Wal-Mart and J.Crew. You just don't. The only counter-argument is that Vanity Fair was just royally kissing up to Obama. Because there is no way they think she dresses better than Carla Bruni! Not really "budget-friendly" is it now? Now multiply $900 by all the different appearances Michelle has made since February 2007 (when her husband announced his candidacy), and you should get to $150,000 pretty quickly. But it's ok. Because she is a democrat. This is not a J.Crew dress. This dress comes directly from the Jennifer Convertibles Catalog. It is also available in sofa bed and love seat sizes. That it is ok to spend money on clothes only if you are a democrat. If you are a republican you shouldn't be allowed in any of the high end stores, because they're just too good for you! People need to stop comparing themselves to these presidential candidates. I understand that you wouldn't spend $150,000 in clothes, but I bet that you're not running for VP neither, are you? Amen! I was dying with the whole J. Crew thing. Such perfect political timing ... I'm soooo sick of this whole thing. Yesssss! The one-sidedness is getting really old. Bring on the election. Bless you! I'm so sick of the double standard! I'm sure Barack and Biden don't wear suits from Target. I also believe that Michelle should dress just a bit more formally while campaigning for her husband--she often does NOT look so classy. Also, the details of the Palin story, following the liberal-rage-inciting headline, if anyone bothered to read further, are that aids and staff purchased a bunch of clothing items without Palin present, and she tried them all and sent back the lion's share. AND that since the convention is over, she's been wearing her old (her OWN) clothing on the trail. If you want to hear about REAL squandering of donor funds, that Greek-column set the DNC bought for Barack's coronation, I mean speech, cost a rumored FIVE MILLION DOLLARS. So well-spent, don'tcha think? It's amusing the hypocrisy--Democrats present themselves as the party of the poor and disenfranchised!?! OH thank you! When you think of the multiple appearances she makes a day, shoes, accesories, etc $150,000 is a good price. She also has to have someone with her at all times for hair and make-up. I would also like to add that first ladies are never criticized for their dress and yet it costs hundreds of thousands of dollars! Thanks for putting this in some perspective! i dont think its a democrats or republic thing because not that long ago Edwards was put on blast for his expensive hair cut. The media does it to both sides, but somehow people forget. The only reason they do this is to distract people from the real issues. IMHO, as soon as you started making comments such as "But it's ok, and nobody complained. Because she is a democrat," you made it political. I don't think $150K is a lot to spend on clothes either, but Ms. Palin chose to build a big part of her campaign around the fact that she was an "average Jill hockey mom" who shops at WalMart and consignment shops. I think the fact that she was so disingenuous is what caused all the uproar. Also, the other three candidates all pay for their clothing out-of-pocket - their campaigns have not picked up the tab, as the RNC did for Ms. Palin. I am so sick of all this electioneering and can't wait for it to be over. Disingenuous? Hardly. Are you willing to make a vice-presidential acceptance speech at the mercy of teh internatinal media while wearing a WalMart dress? This, no joke, is what an interviewed dem staffer thought would have been appropriate. The money was not from taxpayer funds, so why do you care? What's more egregious, I think, it the pettiness of the mainstream media, obviously swooning over Barack, thinking this is actually newsworthy, even seeking out the owner of the consignment shop at which Palin says she prefers to shop at home. Much more significant election issues could have been examined with all the resources wasted on this nonissue. My goodness, get a grip, Anonymous, this is a fashion blog. I agree, sometimes the media makes mountains out of molehills. Frankly, the candidates could wear burlap sacks for all I care. What I do care about is where they stand on the issues that matter to me. I stand by the disingenuous - defined as "insincere, dishonest, untruthful, false, deceitful, duplicitous, lying, mendacious; hypocritical." The Democrats are not the ones who went around saying she shops at WalMart and consignment shops - Ms. Palin said those things, in an effort to identify with her base. To then wear haute couture is disingenuous. She can't eat her cake and have it too. That's all I was saying. Waaaay before Sarah Palin was in the picture, Michelle Obama was pictured etc. wearing brands such as H&M and White House Black Market. Her wearing J.Crew wasnt out of the ordinary. If Michelle Obama puts on a $900 dress at one or two occasions, why not?? Thats what the average person/ "hockey mom" would do as well. When you have a special occasion dont you dress up a little more? Its not a matter of republican or democrat, but people like yourself are making it that. You have to also take into consideration the time when such news is coming out. With the economy the way it is, to hear that $150,000 dollars in less than a month was spent on one persons hair and makeup, its a little bit outrageous. Dont you wonder just wear that money is coming from?? From the designers that court stars like Nicole Kidman and Angelina at Oscar time by sending them tailor-made gowns in exchange for public promotion of their clothing before flashing cameras? Place a facially stretched into the grotesque Joan Rivers in a stragetic spot at a rally and have her ask the candiate and the wives who "did" their dresses, the cost, etc. who cares what they wear, i rather michelle be vice president any day over palin. I have to agree with plumjewels! Well said!